Every emotion is triggered by a thought. Ever wondered why do you feel sad when your friend lies to you? That is because you thought about the situation, you analyzed it, these thoughts provoked feelings and those feelings in turn triggered the emotions you feel. These are just some basics to start with. In 1972, psychologist Paul Eckman said that there are 6 basic types of emotions: Happy, Sad, Fear, Anger, Surprise and Disgust. Rest of the emotions that you feel/recognize are permutation and combination of these six. 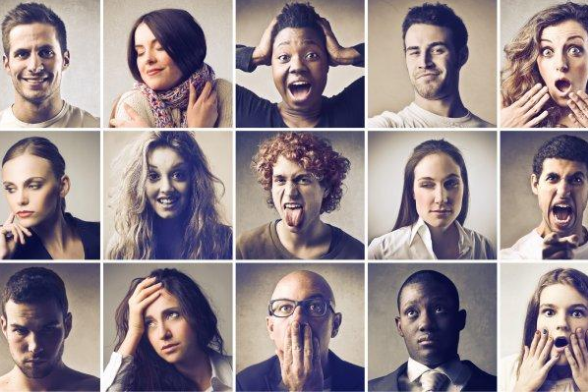 One of the easiest ways to display and detect how you feel or what emotion you possess at the moment is by facial expression. Whenever you feel an intense emotion, your brain sends signals across and your facial muscles respond. Your body reacts to every emotion that you feel. Each emotion that you go through has a bodily reaction to it. If you feel anxiety, you sweat. If you feel angry, your tone changes. When you see a snake/ a tiger, where do you get the energy to run fast? That’s from your emotions who trigger body responses. Two emotions can trigger one common bodily response. If you are fearful of the snake, your heart will beat faster than its normal pace. But when you will encounter someone you are attracted to, you will experience an increase in heart rate again. Why? That’s because different emotions can give rise to common bodily responses. Remember back when you were laughing out loud (literally), and someone who couldn’t contain it, said “jitna hasna hai has lo, baad mein utna hi rona padhega”. Turns out that the person wasn’t all wrong. There have been theories that say that an extreme emotion triggers another opposite and extreme emotion. Did you see now why you get so relaxed right after the interview gets over when you were way too anxious during the interview? During the night hours, your mind is free from the restraints of workload and so your mind can wander to places where it wants to go. So if some situation/event has been causing trouble to you, chances are you will think about it more. Remember what we said about thinking? That it provokes feelings which in turn provokes emotions. Lack of sleep also aids in lack of control of emotions and can be one of the prime reasons why you tend to cry more at night. Negative emotions can be helpful for us to recognize, evaluate and appreciate positivity in every situation we come across. If we have never grieved about the bad, how will we cherish the good? If you are sad, people would notice. If you are happy, people would notice again. That’s because your facial expression play an important role in determining your state of mind. As much as you want to stop your face to tell your sadness, your eyes would speak and so will your faded smile. No matter how much you try, these emotions, you can’t hide. Emotions and our biological responses to them are connected to such an extent that it is far more difficult to fake them. You can’t fake anger for as when you are angry, your body triggers a stimulus that releases hormones which are responsible for your change in voice and action. So, how can you fake it right, tell me? Did you feel sad when your friend cried for a long time? Or did you start laughing too when everybody in the group laughed out loud? Many researches have shown that subconsciously, people copy emotional expressions that they see in others around them. So now you know why when a person smiles at you and without actually thinking you smile back at them. Research has shown that forcing an emotional expression can in turn trigger that emotion. If you are sad and if you force a smile, chances are that your sadness might get washed away with happiness. Your emotions are the slaves to your thoughts, and you are the slave to your emotions. ― Elizabeth Gilbert. But in the end, you are the master of your own thoughts, so why do you get sad at all?